A single change in the diet plan is not an answer to your diet dilemma. Each individual has their own type of body so their diets have to be. There are numerous diet plans and weight loss advice trending nowadays. But how many of them are appropriate and could you really decide what is good for your health and effective for weight loss? From the same lifestyle hack, no two people can achieve the same results. Different bodies have different DNA. And Diet Clinic believes that acknowledging our basic differences could actually act as a key to end the guesswork when it comes to what we should be eating. Stop all the trial and error method on various diets. Know your genes profile and get a Weight Loss DNA Diet Plan here at Diet Clinic. DNA Diet Plan and Testing have set a new standard in the field of fitness, health and dieting. Weight Loss doesn’t only depend on the type of food you eat but also the type of genes you carry inside your body. By understanding the genetic differences, one can easily make out so as to what type of eating habit will suit their lifestyle as well as their body in terms of weight loss. From your DNA Test, one can easily find the suitable nutrition and exercise recommendations to be given. You will be able to discover how much protein, fat and carbohydrates are suitable to you. 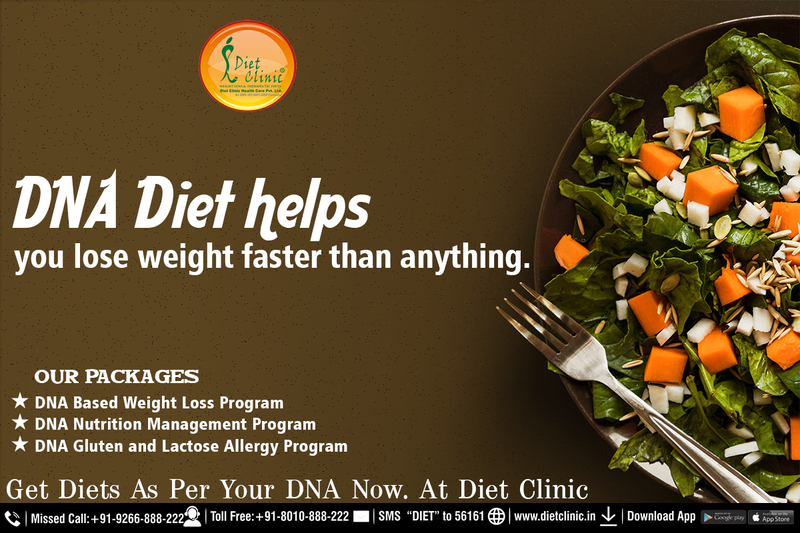 Weight Loss DNA Diet Plan at Diet Clinic devised exclusively by one of the best Dietician Sheela Seharawat enables you to take a better control of many aspects related to wellness and lifestyle. You will be guided completely about how, when and what to eat for your weight loss. Our experts team of top Dieticians will help you in your weight loss journey and will be in contact, just to know the results you are getting after the adoption of Weight Loss DNA Diet Plan. Get your DNA tested here at Diet Clinic and have the best diet plan for yourself. Do you have dearth of time? NO PROBLEM! You can call us or even get in touch with us online.